So it’s been a little quiet over here! That’s because I’ve been coding my heart out over at the Shoshana website, which, I am very proud to announce, is finally finished. 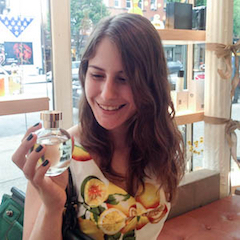 From now on, I’ll be blogging over at Shoshana rather than Scents of Self. Scents of Self will remain archived, so your favorite Trek-tinged perfume reviews aren’t going anywhere. Thank you so very much for reading, and I can’t wait to see you over at Shoshana! So excited for you my dear! The website & shop are beautiful. I’ve already subscribed, and look forward to more details. Next time I am in DC I will make it a point to seek you out! Thanks for the update, Ari! I’m really looking forward to visiting your shop and meeting you. I’m 15 minutes down the road! I’m loving the look of your website and the store design. Good luck with these final few months – I know it must be a lot of work! Oh, I’m so excited to hear from a neighbor! Please feel more than free to come by before the shop opens, too- there are lots of cute places here to have dinner or gelato! Congratulations! This is exciting–to see the store coming to life! I’ve missed your posts and I look forward to getting all your news. I already signed up. This is the sweetest comment. Thank you so much, Suzy Q! Congratulations! Signed up and looking forward to updates on your progress! I am honored and thrilled to have one of my favorite, longtime readers along for the ride, Barbara. Thank you, A!! That’s so nice to hear after slaving over it for the last few months! Oh, Ari, what a wonderfully-designed shop! I’m so excited for you–and we’ve never even met! If I am ever in D.C., I’m going to pop in and hope to meet you and treat myself to “a little something.” Will you be taking orders and shipping goods? Ari – Wow, you must be so excited! Heck, I’m incredibly excited for you and for DC. The store’s renderings are fantastic! What a thrill…and brands like NV…just wow. Congratulations! It’s all happening! Yay! That’s wonderful! Best of luck to you on this new venture. Woo hoo! Let us know when it’s opening. I will absolutely try to be there if the opening is on the Saturday before Labor Day. Congratulations! And I LOVE the logo! How exciting Ari! I don’t know how I missed this post! !